Red is such a vibrant and expressive color. It’s a real shame people seem to not to know how to wear it and shy away from it. Well, allow me to let you in a little secret about red, in particular red pants: they are a simple thing master and wearing them will help you stand out in the rest. Just don’t hesitate—that’s how you wear them! Oh, and don’t wear them alone. 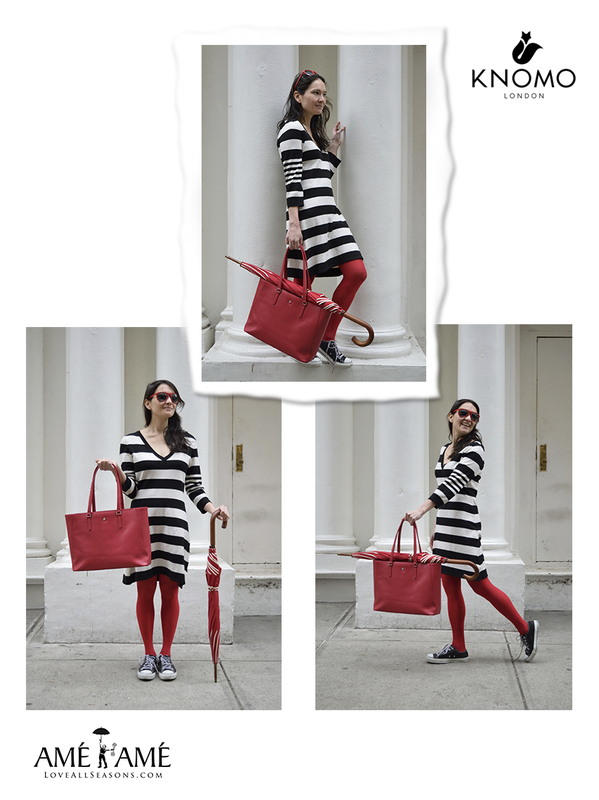 Accessorize with matching red sunglasses, a red umbrella and a red bag, like I did with this red bag from Knomo. And last but not least: wear chucks. They’ll tie everything together and you’ll look effortless wear them. That’s why #iheartchucks so much! To start your adventures in red, you can find the Knomo bag I’m wearing for yourself at Amé Amé. Amé Amé is located at 17 W 29th Street, NYC, between 5th avenue and Broadway—across the street from the Ace Hotel. This entry was posted in Accessories, Umbrellas and tagged #iheartchucks, #ootd, chuck taylors, converse shoes, how to wear red, how to wear red pants, outfit of the day, red accessories, what to wear with red, where to buy a red umbrella in nyc, where to buy knomo bags in nyc, women's fashion by AmeRain2. Bookmark the permalink.